The 90s were an awkward time for comic books. 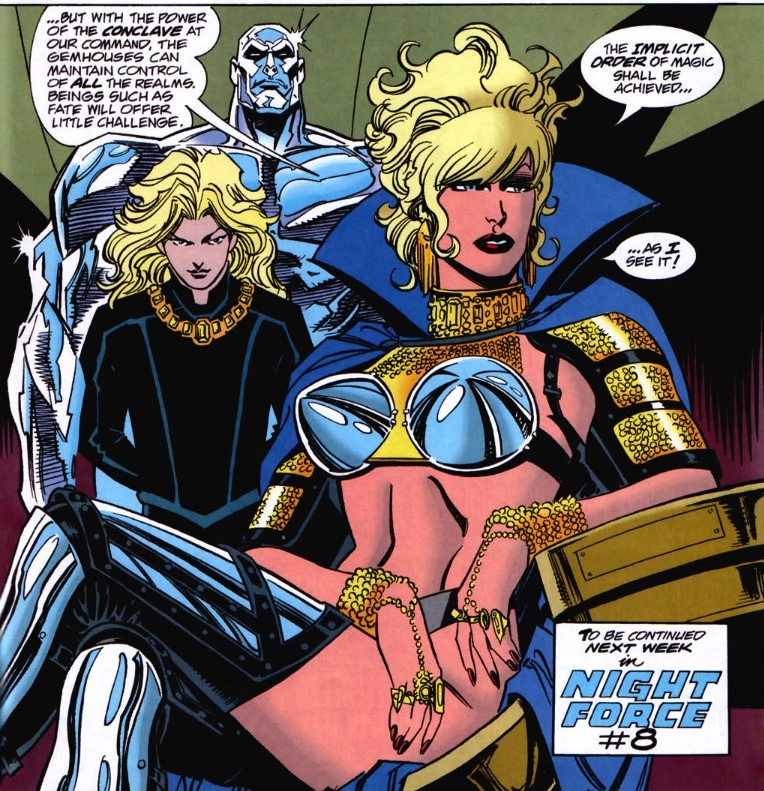 This awkwardness extended to Keith Giffen’s usage of Amethyst and the Gemworld in a crossover series called “Convergence” in the “Weirdoverse,” some loosely connected comic books that dealt with magic in the late 90s. For more on the Weirdoverse, I refer you to this helpful Wikipedia article. I thought I would take a brief look at Book of Fate, and then I would delve into Convergence. It features unusual interpretations of a number of characters from the Gemworld. Basically Jared Stephens is the new Dr. Fate. You can tell he is all ’90s and edgy by the cover of the first issue of Book of Fate, which features our dude smoking, embellished with a strange eye tattoo, accessorized by random sharp objects, sporting a trench coat with the sleeves ripped off, and spelling the word magic “magik”. He also looks as if he has just pooped out a mystical knife, which I imagine would be quite painful. Fate used to be a grave robber, but then he was possessed by the power of the Lord of Order, and now he is taking his magical powers to the streets of Boston! 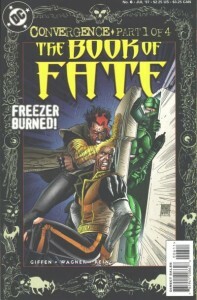 The first issue of the Convergence crossover that features people from the Gemworld is Book of Fate #6. If you check out the cover, you will see Fate and a certain long-winded blond prince trying to escape from some stormtroopers with armor of an emerald hue by shoving them into a refrigerator. 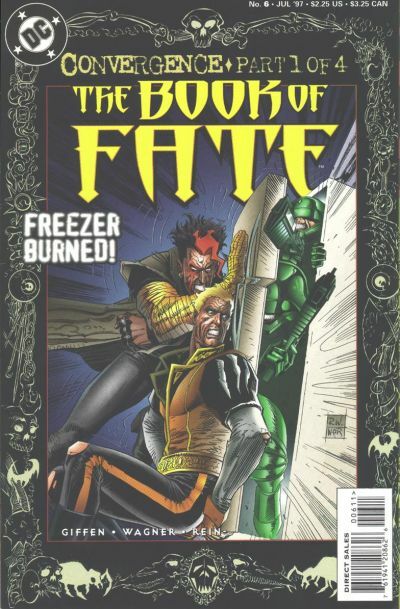 The text on the cover says “Freezer Burned!” Oh, 1990s era comic books, how I do not miss you. Actually I stopped buying comic books all together in the 90s and only started again when I realized that Matt Wagner was publishing Mage again. That was a good series. 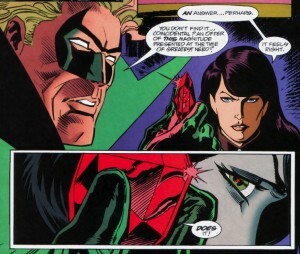 The issue opens with Green Lantern/Sentinel Alan Scott visiting an alien world inhabited by two races. They were dependent on each other for survival and killed each other, leaving a world filled with corpses. In Washington DC a senator appears to be possessed by evil. How someone could tell the difference between him and a regular senator, I’m not sure. I suppose senators don’t usually have red eyes. A magical council votes to dissolve itself. Zatanna is depressed. She and Alan Scott confer. He holds up a ruby and asks if it seem strange that she got an offer that contains such power just as the magical council dissolved. She says it feels right, the ruby reflecting red in the pupils of her eyes. They ask for a explanation of the mystical rune on Fate’s t-shirt. 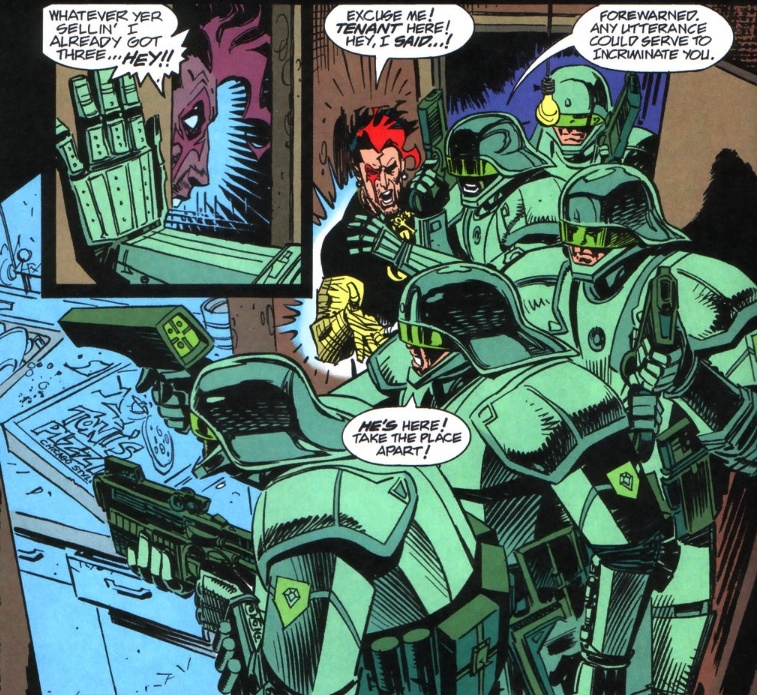 The emerald soldiers also appear to have a gemstone insignia affixed to their shoulders. Hmm…..what could it all mean? The soldiers fondle Fate’s mystical artifacts and pronounce the area clear, warning “aiding and abetting a known fugitive is a serious offense! Think twice before getting involved again!” Fate has no idea what they are talking about, and they disappear in a flash of green light, leaving behind a ruined apartment. Fate decides to settle down with a beer when he spots a blue gem in his refrigerator. He takes it out and puts it on his table. There’s a flash of blue light and a blond man appears! Why, he looks suspiciously like Prince Topaz! He yells, “The Fate! You are he? 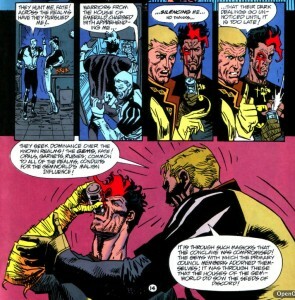 !” Fate says “Yeah…Fate…Sure…” Topaz starts a torrent of exposition. Fate, being a big jerk, doesn’t believe Topaz and basically gives him the brushoff by promising to investigate while escorting Topaz to the door. 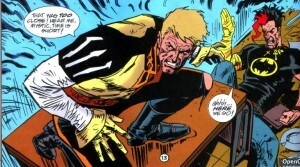 Topaz senses that his enemies are near and yells “It is too late! They have found us!” He dashes down the hallway. 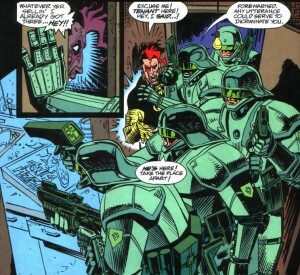 The Emerald stormtroopers appear in the hallway, and aim their guns towards Fate. He’s going to be executed for aiding a fugitive. Fate joins Topaz in his attempt to run away. Green blasts go off everywhere. 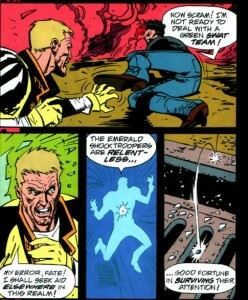 Topaz decides on an alternate means of escape by turning back into a blue gem and heading for the sewer. Fate is left in the middle of wreckage, surrounded by police, and quickly arrested. Elsewhere an evil cabal observes the situation. Who is leading the evil cabal? Yes, it is Amethyst! As much as I enjoy making fun of Prince Topaz, I actually didn’t mind his characterization here as a harried man who manages to be extremely verbose under trying conditions. I found him rather adorable, particularly his new ability to transform into a blue topaz combined with his habit of hanging out in refrigerators and sewers. Unfortunately as you can see by the end of the issue, Amethyst has been the recipient of an unfortunate personality transplant and an even more unfortunate wardrobe. We will delve into these issues further when I can summon up the mental strength to read Night Force #8. This entry was posted in comics and tagged Amethyst Princess of Gemworld on 10/4/2009 by Anna.